PUBLIC health programmes in India are focused on infectious diseases like cholera and malaria. But non-communicable diseases (NCDS) like cancer and heart ailments are known to kill more people. Union health minister Ghulam Nabi Azad acknowledged rising incidence of NCDS at a two-day World Health Organization (WHO) meeting which concluded in Delhi on March 18. “It’s high time we take stock of them,” he said signalling a shift in government policy. The Union health ministry which launched the National Programme for Prevention and Control of Cancer, Diabetes and Cardiovascular Diseases last year in 100 districts, is planning to extend the programme to all 640 districts in the 12th Five-Year Plan. Efforts to control these diseases will get a push in September when world leaders chalk out an action plan for controlling and preventing NCDS at the UN general assembly meeting in New York. “NCDS contribute to 60 per cent of the total burden of diseases in India, making it the biggest killer,” says L M Nath, former director of the All India Institute of Medical Sciences, Delhi. Indians are genetically predisposed to these diseases. WHO has projected a 21 per cent increase in deaths caused by NCDS in Southeast Asia between 2006 and 2015 as compared to 16 per cent increase in deaths caused by infectious diseases. “Till now we were living in the hope that once communicable diseases are under control, we will shift focus to NCDS. But now health policy makers have realised that sidelining NCDS may cost us big,” adds Nath. But the problem is the government still has to grapple with unfinished agenda of communicable diseases, even as the burden of NCDS is rising, points out V Mohan, secretary of advocacy group, The Indian NCD Network. The Indian Council of Medical Research says NCDS account for 60 per cent of the deaths caused by diseases around the world. 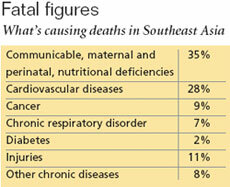 Eighty per cent of these deaths occur in developing or lowincome countries like India. Many of these deaths can be prevented. “Eighty per cent heart diseases and stroke, 80 per cent type II diabetes and 40 per cent cancers can be prevented by eliminating common risk factors like poor diet, physical inactivity, smoking and high intake of salt, sugar and trans-fats,” says Renu Garg, regional adviser with WHO’s South-East Asia Regional office.